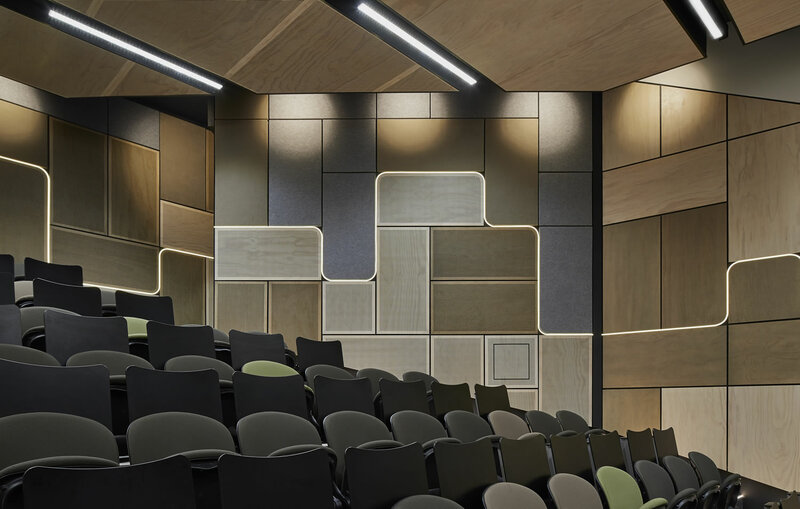 Completed in 2016, Deakin Lecture Theatre provides an interactive and technologically advanced lecture theatre for Deakin University. k20 Architecture’s director Anthony Uahwatanasakul felt the idea of ‘connection’ would support the development of the design. The notion that a space could connect the experience of teaching and learning was the foundation idea for this project. 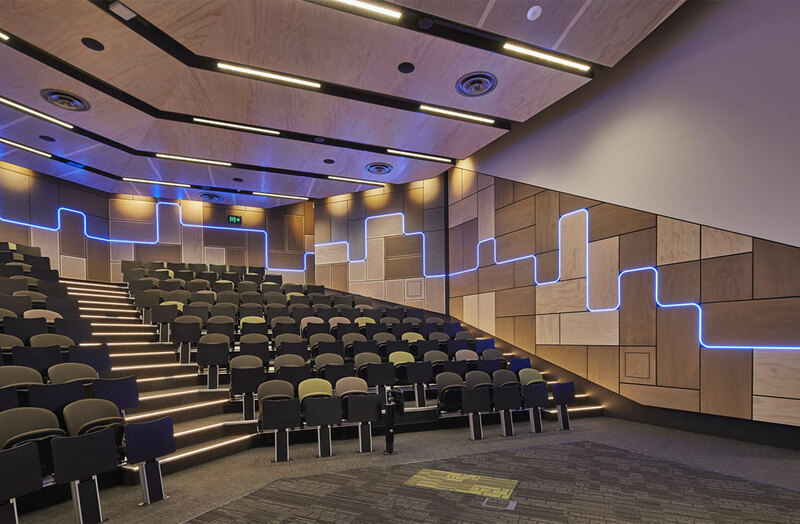 By integrating LED lighting throughout the lecture theatre k20 Architecture provided the opportunity for a constant link continuing from the ‘stage’ to the ‘back row’. 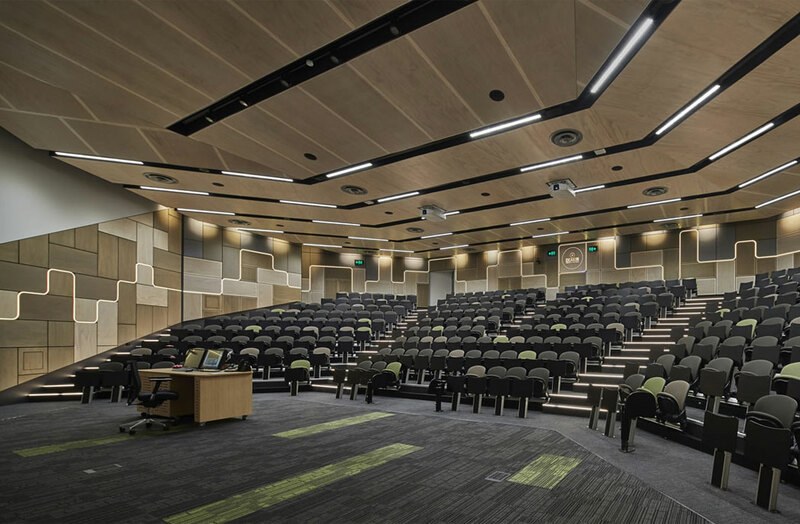 As the Waurn Ponds’ University main lecture theatre, the interior was in need of refurbishment that includes new state-of-the-art audio-visual technology as well as improvement to the acoustics and a modernisation of the aesthetics. In formulating the concept behind the design, k20 Architecture reviewed the history of the campus to better understand the ethos of the university. k20 Architecture realised that it was the connection to people, education and learning that inspires Deakin University. In a time of social media and technology interaction, it was imperative for the University to be able to provide webinars and podcasts for students not able to attend in person seminars. For this reason, k20 updated the lighting to better enable videoing of lectures. 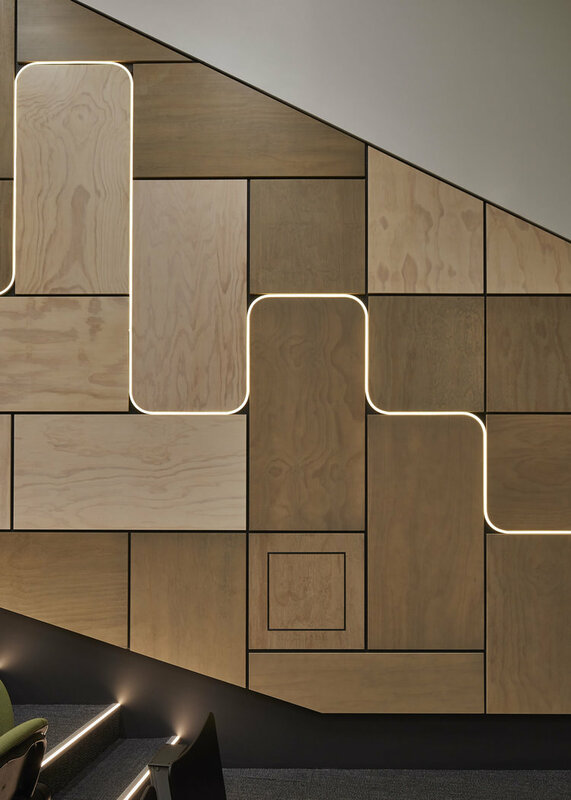 k20 Architecture translated the idea of ‘connection’ to the materiality, ensuring that there were correct aesthetics with acoustic lining treatments that were compatible and durable. This also included a bespoke lighting feature within the space. The lighting feature was a representation of the Deakin University Waurn Ponds campus from an aerial photographic viewpoint and the patterns of the lighting panels have been subtly coloured to delineate a map of the University on the panels. k20 Architecture retained as much of the existing building structure as possible to minimise the amount of demolition landfill, and the removal and replacement of material. A review of existing services was conducted that included mechanical and electrical circuitry and these were refurbished and improved to create a more efficient mechanical system for conditioning the lecture theatre space. 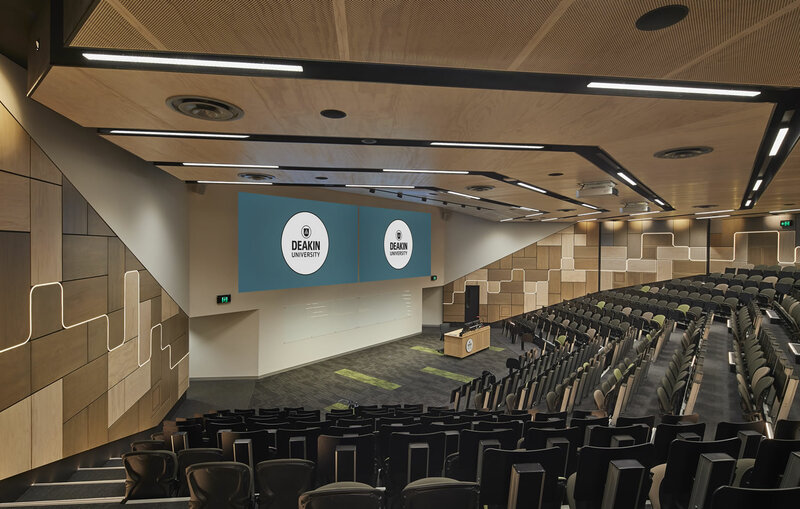 Take a look at another project at Deakin University.